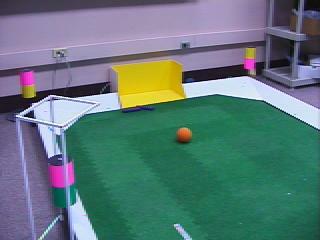 To create a simple, robust vision system suitable for real time robotics applications. The system aims to perform global low level color vision at video rates without the use of special purpose harware. We now have a mailing list on FreeLists.org. Please consider joining if you want to learn more about CMVision. Version 2.1 is now is now available: CMVision2.1a.tgz. 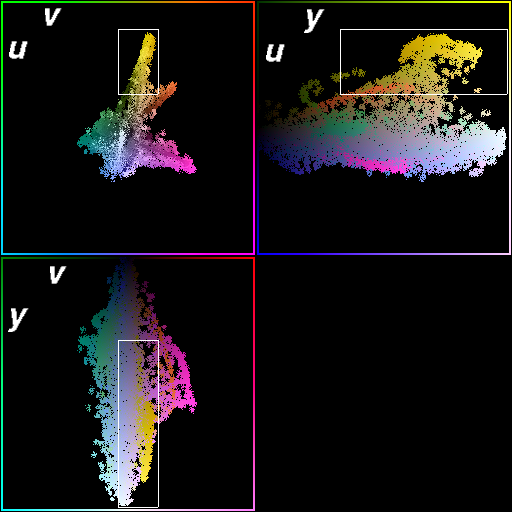 Version 2 allows arbitrary thresholds using a subsampled version of the entire joint histogram (i.e. a subsampled 3D matrix). Other than different thresholds however, much of the core interface is intact, though it has now been recoded to take advantage of templates, allowing easier extension for particular projects without the need to edit the library code directly. This release is covered under the GPL. 8-Feb-2004 CMVision was mentioned in the links to outside software on Darpa's grand challenge website. CMVision was aimed primarily at vision indoors with semi-controlled lighting, but I'm happy to see it show up wherever people think there is a use for it. Thresholding is often very application and environment specific, while the other operations fit in to a much broader class of vision tasks including outdoor vision. Thus the routines for run length encoding and connected components seem to be used separately by a lot of people. That makes me happy too. 30-Nov-2003 Support for CMVision 1.x has been added to the Player/Stage system. It is a portable networked multiagent robot simulator. 30-March-2002 A beta for Version 2.0 is now available: CMVision2.0-beta1.tgz. This new version allows arbitrary thresholds using a subsampled version of the entire joint histogram, and uses templates entensively allowing easier extension for particular projects without the need to edit the library code directly. 6-December-2000 Version 1.2 is now available. (cmvision-1.2.0.tgz, cmvision-1.2.0.zip, online source) Average color, density merging, and dual threshold support has been added. 14-April-2000 Version 1.0 has been released. 29-November-1999 The package has been finished and the general library includes all the attributes of the three versions used by our lab, except for density based merging, which was implemented as a hack and will be re-introduced in a more elegant way later. 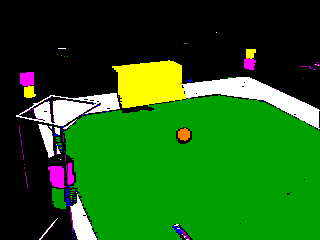 Histogram of the above video image, with the yellow color threshold outlined.